"I have not seen a better helmet come along in terms of accuracy yet." Accuracy, hands down mine is by far better. People don't know just how much better unless they own one. Ask anyone who has a v2 helmet and I'm certain they'll agree as pretty much all of them have owned or own a Matt helmet. That really puts me at a disadvantage as I don't offer very many of mine and Matt has probably sold hundreds. It's really just a matter of people not knowing any better through no fault of their own. Cost, availability, etc... are not criteria that I dispute. Now we understand each other in regards to the helmet thing. 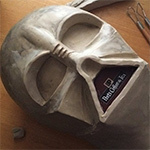 If you do ever get off your Vaders long enough to do some helmets, let me know. Last edited by Midnight Trooper on Tue Apr 24, 2007 8:02 am, edited 1 time in total. Do you have a link to pics of your Hero Trooper, too ? I'm always surprised when someone asks for pics because I've posted them so many times, I figure everyone who is a trooper fan must have seen them. I tried to match as closely as possible Dave M helmet. - Faceplate taken from Brian R original film used helmet. - Cap/back taken from Brian R helmet, bumps/texture included. - Earcaps taken from Dave M. original film used helmet (the one that was identified on screen!) . Correct shape and size. - Cast from original hovi-mix mic tips accurately assembeled and detailed. - ALL hand painted details. NO DECALS anywhere. - Green lens material attached at the earcap screws. - Correctly shaped yellow foam head insert. I tried to match as closely as possible the promo hero trooper. The one used for the cardboard standee and found in the Chronicles. This trooper was also extensively used in the film. - Accurate color and gloss level plastic. Unpainted. - Faceplate taken from Brian R. original film used helmet, slightly altered to be ANH hero accurate. - Cap/back taken from Brian R. original film used helmet, bumps/texture removed and details sharpened to hero specs. I know I've seen them before... but man... those are just sweet! Absolutely stunning workmanship Gino on both the hero and stunt helmets. To address Midnight trooper im not really sure HDPE is any more durable than styrene theres certainly evidence on screen of cracks and tears in HDPE helmets the fact is the way the helmets are made means that there are areas of stress couple that with how thin the material is and you will see in some cases splits and tears regardless of what kind of material is used. I'm sure that there are many TE styrene helmets out there that haven't suffered from this problem it's unfortunate yours has. If you are going to get a HDPE helmet for accuracy then to follow that accuracy you should also use the correct kind of paint as used at the time and as we all know that was a major pain for them back then to get paint to adhere to the material and over time the paint flakes and cracks exposing the material underneath. I'm sure that there are modern paints that one could use that would adhere properly but i dont see the difference between a pristeen paintjob on an HDPE to a styrene. HDPE is much more durable than Styrene. It is virtually unbreakable and you'll notice that the cracks on the helmets are in the sharp angle cuts at the temples. I tend to think the cracks are actually rips or tears as it is very hard, almost impossible to crack HDPE. I think these new TE helmets are nice but if they are not the right colour then there is no point to them IMO. I would argue that my helmet is FAR more accurate than any helmet TE has ever produced. But are you still offering TK's? The last time we spoke, I was of the understanding that you were no longer offering them. If I'm wrong, and you are indeed currently offering it, what's the price if I may ask? I echo Midnight Trooper's statement: "I have not seen a better helmet come along in terms of accuracy yet. If you find another helmet which is not cheap styrene and comes complete with accurate interior details for under $450, let me know." Just give me a good alternative to TE for my purchase. Well, we haven't been shown picture samples of the three color types of HDPE TE is using... would hope that he would show them soon. Welcome to The Den, troopermaster! Well... afaik there are only TE and GINO with the über-accurate bumpy cap helmets for stunts and with the accurate ears for the Hero. I could be wrong though... my knowledge regarding troopers is very limited, really. Also, the TE doesn't come painted, only assembled. You have to paint it yourself, from what I've read. Please correct me if I'm wrong. You're correct NHM the TE is an unfinished piece even so i think the price is reasonable and it is without doubt a great helmet my only issue is the material. I have no idea what Gino asks for his helmets but i'm sure the price would reflect the extra work and time taken to supply a fully finished helmet with all the handpainted detail etc. Kind of like comparing the price of a kit car with a ready to drive one.